Bloat - Pasture Spray is a Ready - for - use product that is based on an emulsifiable mineral oil formulation. 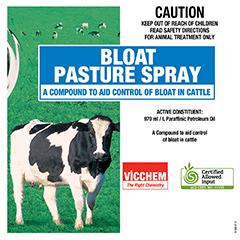 To prevent bloat, Bloat Pasture Spray needs to be consumed regularly. Always follow the directions for use on the label. Drenching cows with BLOAT-DRENCH is the most effective and reliable method to prevent bloat. To provide satisfactory protection it is important that the pasture is sprayed with BLOAT PASTURE SPRAY regularly. If a cow is bloated consider drenching it immediately with BLOAT-DRENCH or BLOAT PASTURE SPRAY. Bloat is commonly caused in cows by the formation of a stable foam in the rumen which traps the gases produced during the fermentation process. The accumulation of gases produces a distension of the rumen (bloat) which can lead to a decrease in pasture intake and consequently milk production. If left untreated the cow may die from the effects of bloat. BLOAT PASTURE SPRAY contains mineral oil. This product will assist in preventing bloat by breaking down foam after it has formed in the rumen.